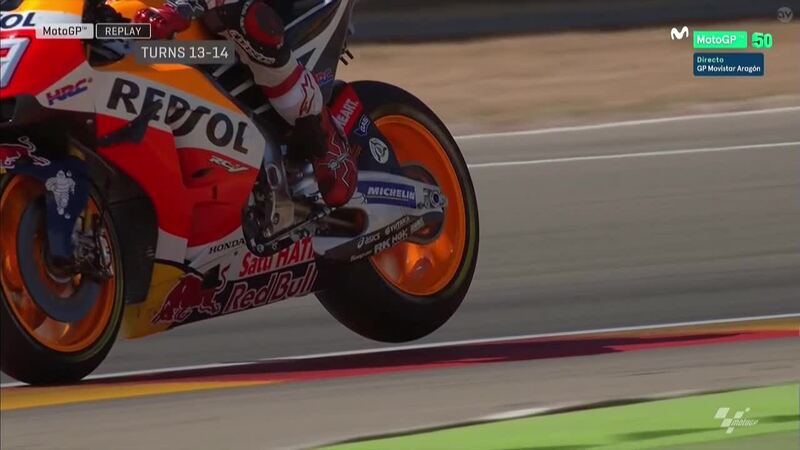 Marc Marquez (Repsol Honda Team) has taken a stunning win at MotorLand Aragon to extend his championship lead ahead of the flyways, with Movistar Yamaha MotoGP duo Jorge Lorenzo and Valentino Rossi dueling it out to complete the podium. 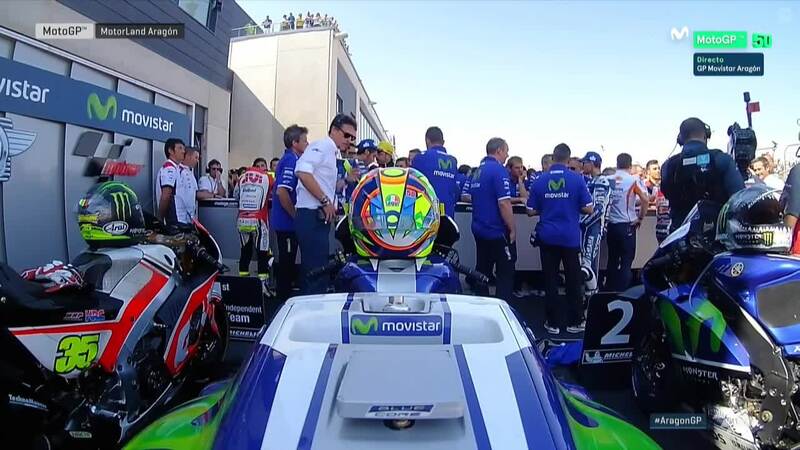 After re-taking his teammate and defending P2, the Mallorcan held off Rossi before the Italian ran wide, forced to settle for P3 in an expensive day in the title fight. 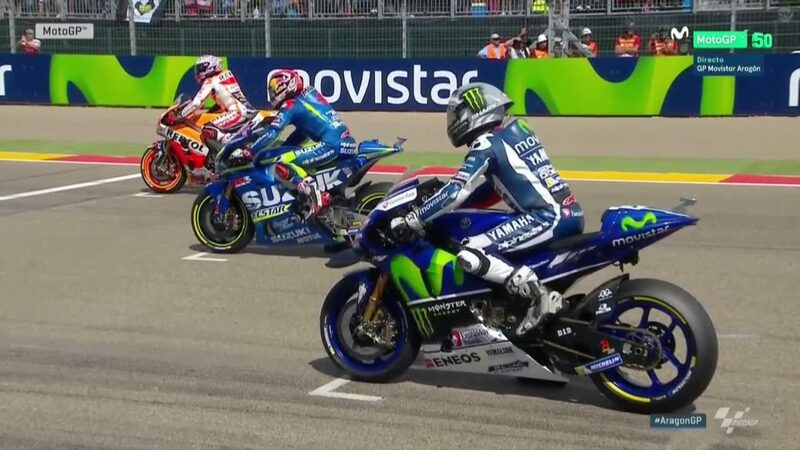 After a scuffle off the line through Turns 1 and 2 at a dry but cool MotorLand Aragon, it was Team Suzuki Ecstar rider Maverick Viñales who emerged from the melee to turn his front row start into the early lead in the race. 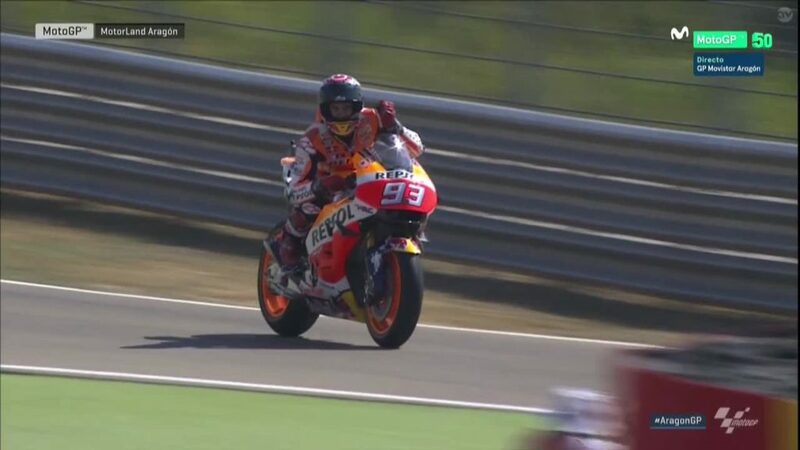 With the front group close all the way down to P8, Marquez soon struck to take the lead, before a wobble through Turn 7 saw the championship leader drop back into the group slightly, down to P5. 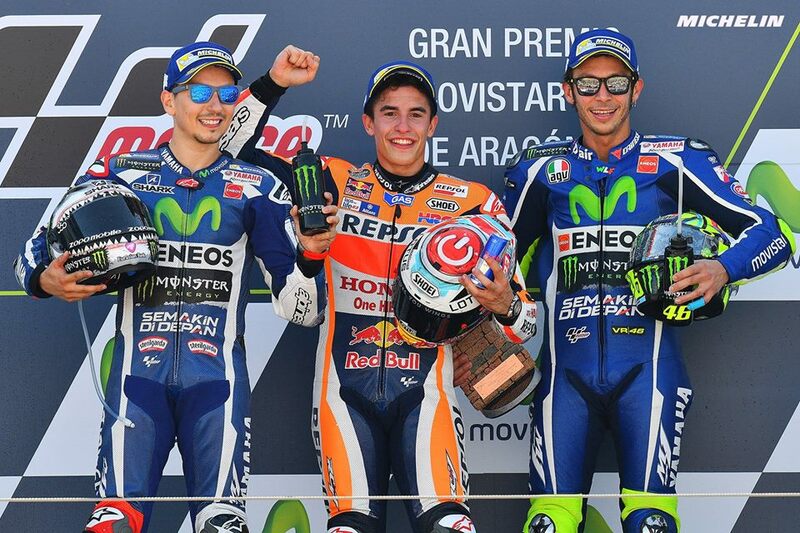 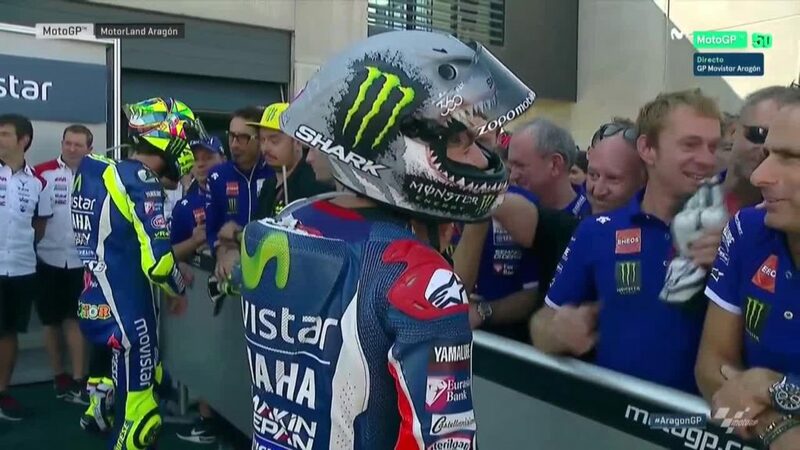 Lorenzo was the man on the chase behind new leader Viñales, with teammate Valentino Rossi in very close company. 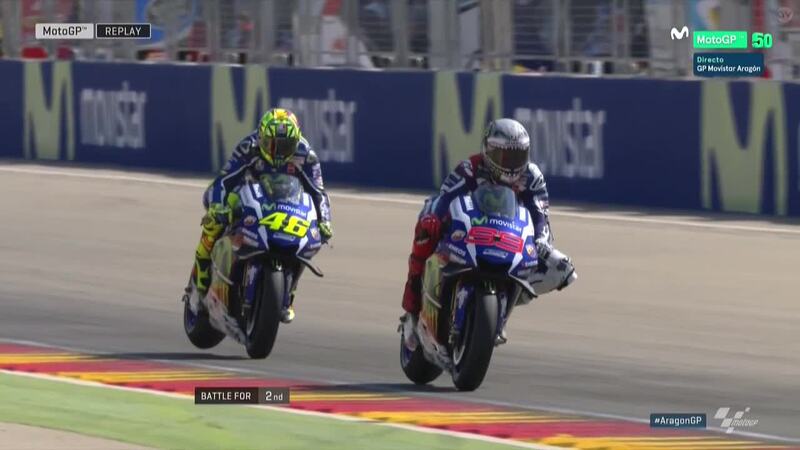 The lead began to stretch for the Silverstone winner, before it was Rossi tagged onto the back of the Suzuki rider and looking for a way past, finally making a clever but aggressive move to take the lead with 15 to go and sit the younger Spaniard up. 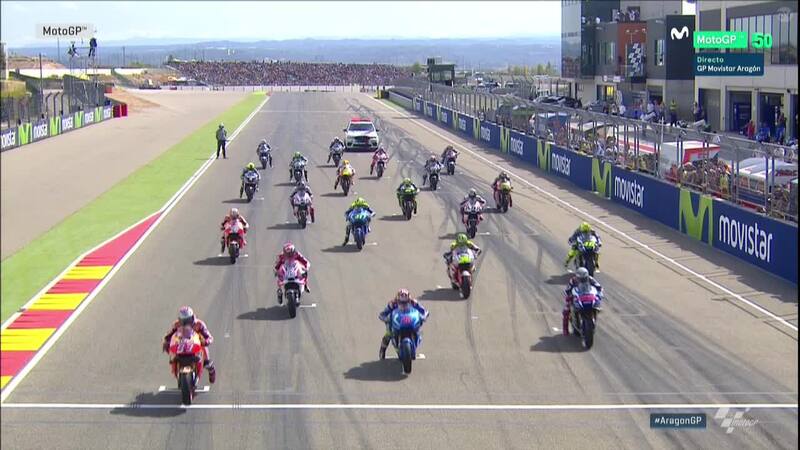 Viñales, pushing to find a way back through, then ran wide at Turn 1 and let Marquez through to hunt down his championship rival. 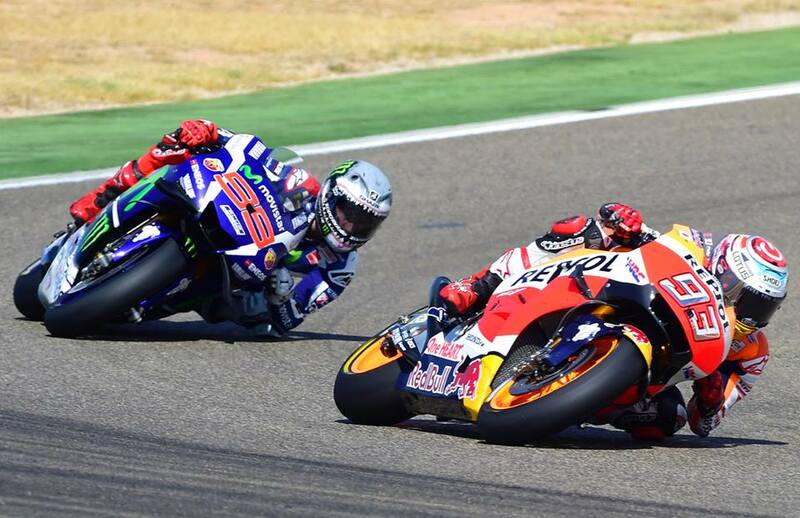 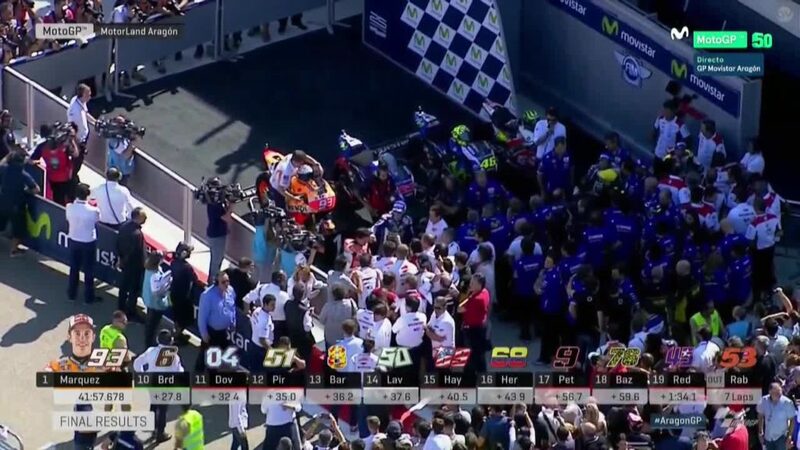 With Lorenzo then on the scene, the front group divided into two duels. 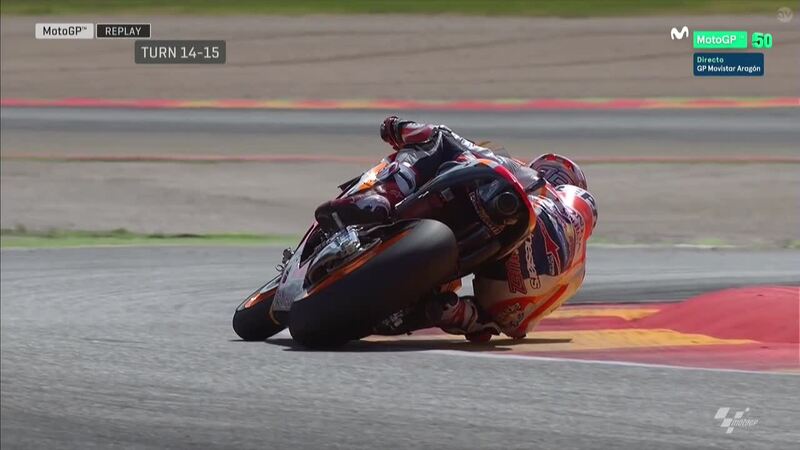 Once with rider from Tavullia, former apprentice Marquez moved quickly to overtake the master, through on the inside on the ‘Aragon Corkscrew’ and making it stick. 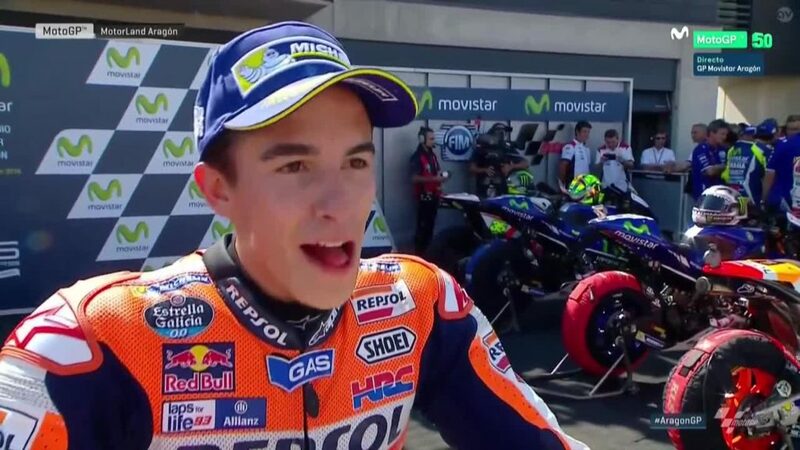 The championship leader then had the pressure of 9 world titles close behind and trying to hang on, but Marquez kept his head down and the pace up to slowly begin to get the better of the Italian and create a gap. 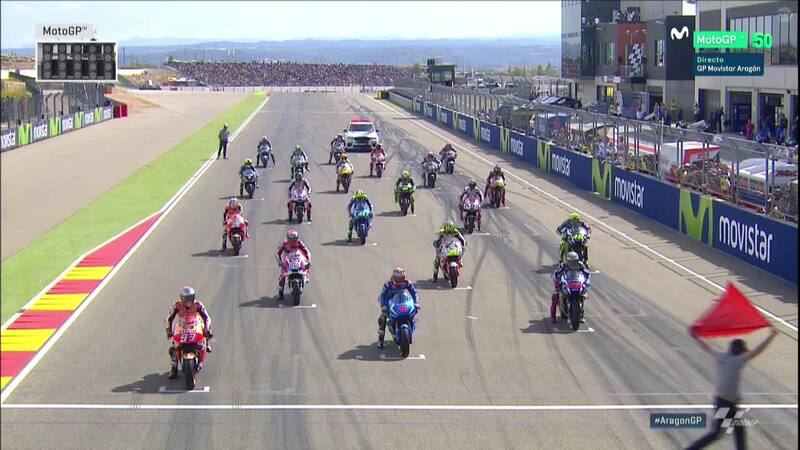 The pace shown by the 2013 and 2014 MotoGP™ World Champion throughout the weekend on home turf proved to have survived the trip to Sunday, as the number 93 bike started to get smaller and smaller in front of the 46 plated Yamaha – with Rossi then forced to start looking over his shoulder instead as Lorenzo and Viñales threatened. 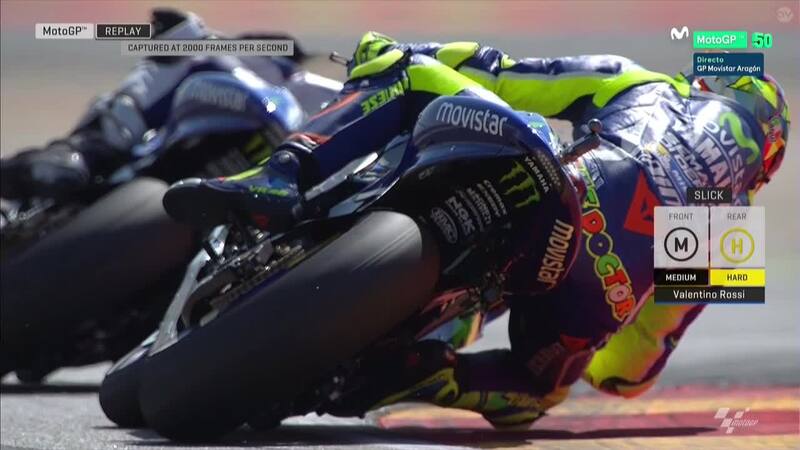 As the laps ticked on, Lorenzo left Viñales and caught Rossi, with the Movistar Yamahas then locked together in a fight for P2 and the ‘Spartan’ holding off the ‘Doctor’ – until the Italian ran wide into Turn 1 on the final lap. 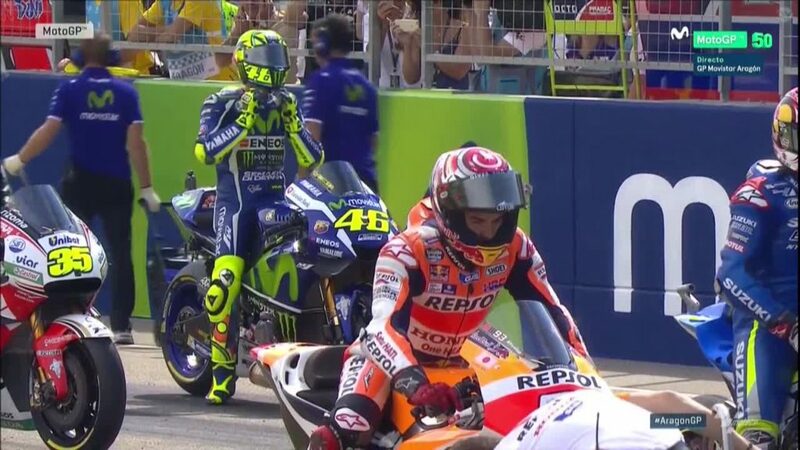 For Rossi, the missed opportunity is a big one as he fights to close on title leader Marquez – dropping 9 points with the championship leader taking the win. 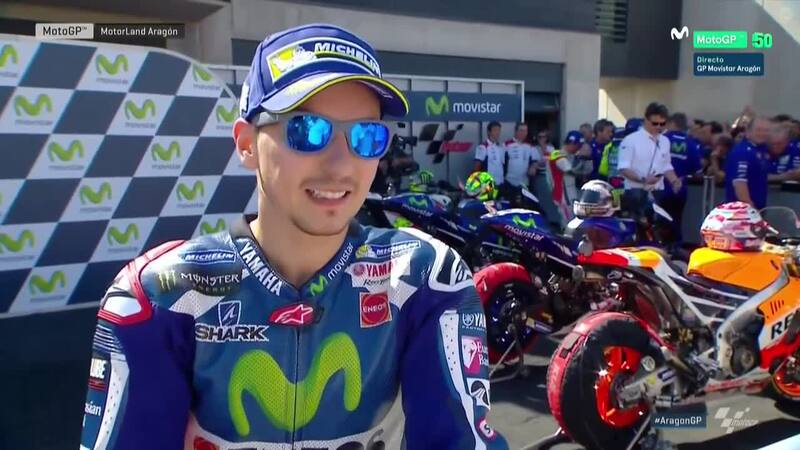 Lorenzo, after a difficult weekend until a last minute front row, recovered well from a crash in morning Warm Up to cross the line in an impressive P2. 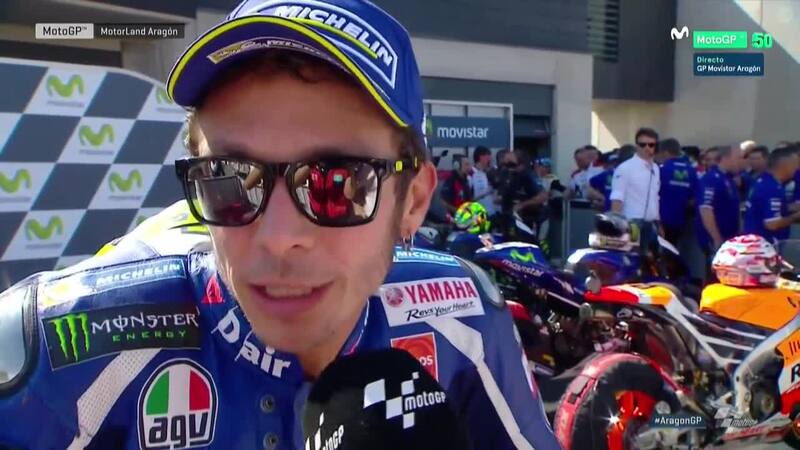 Viñales kept his Suzuki in fourth after dropping back in the latter stages of the race, earning another top five for the impressive Spaniard in only his second season. 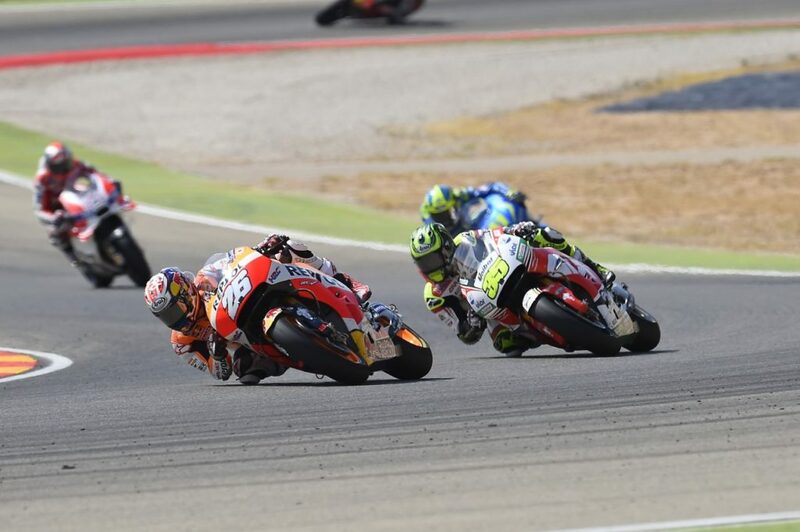 Cal Crutchlow (LCR Honda) had a solid ride to prove top Independent Team rider in fifth, just ahead of Misano winner Dani Pedrosa (Repsol Honda Team) – who had a more difficult race at MotorLand but crossed the line in sixth to beat Aleix Espargaro (Team Suzuki Ecstar) in the final stages, with brother Pol Espargaro (Monster Yamaha Tech 3) behind him in P8. 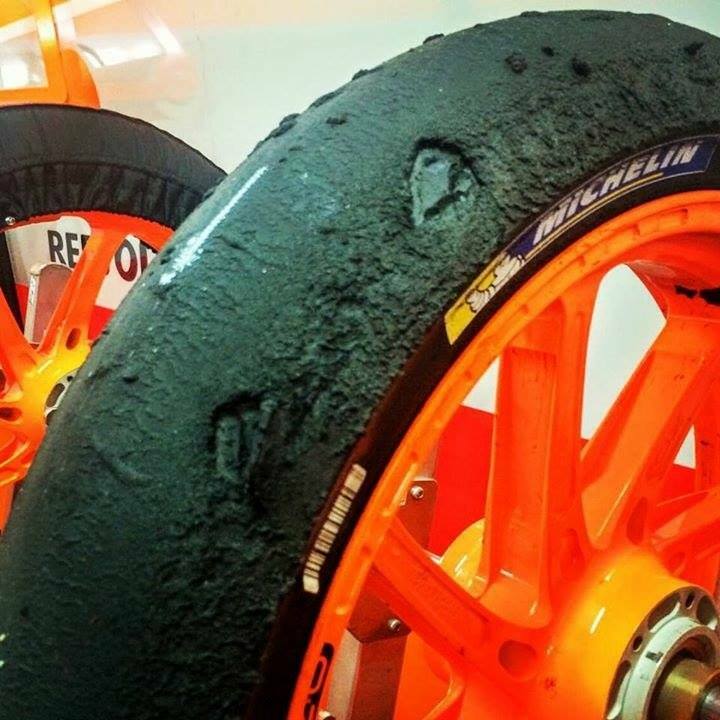 Ducati Team’s Andrea Dovizioso had a tough race despite being a frontrunner in the early stages, and was one of the only bikes in the initial group of frontrunners to have chosen both medium compound tyres. 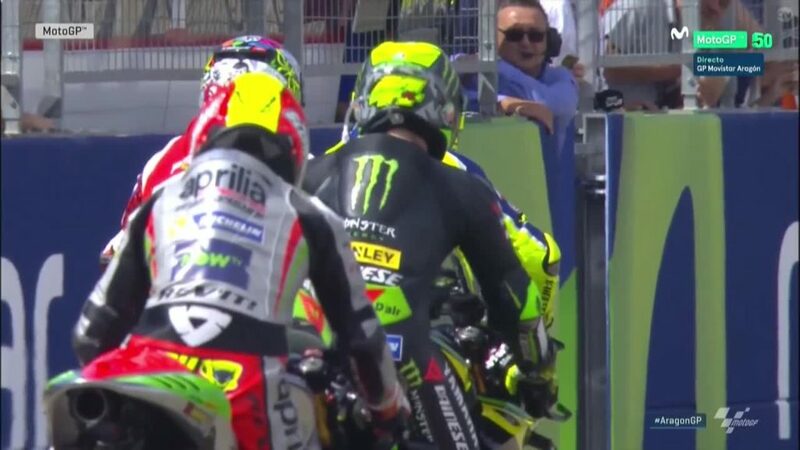 With six laps to go the Italian veteran was under fire from Aprilia Racing Team Gresini rider Alvaro Bautista, with Bautista taking the Ducati to finish in an impressive P9. 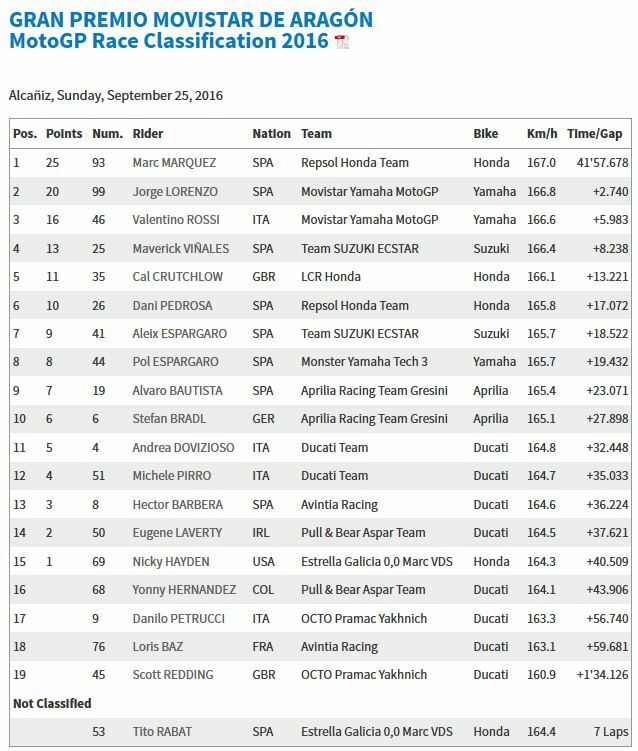 ‘DesmoDovi’ then found himself taken by the second Aprilia of Stefan Bradl, and ended the race just outside the top ten in P11. 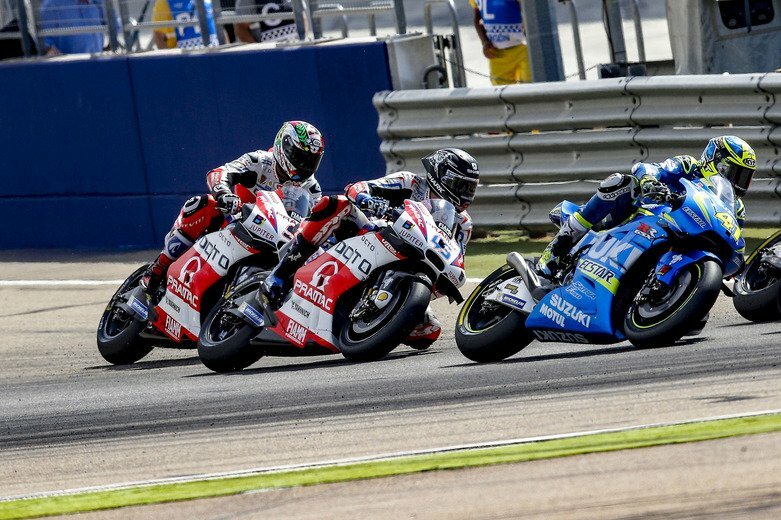 Nicky Hayden’s (Estrella Galicia 0,0 Marc VDS) one off return from WorldSBK to sub for injured Jack Miller was a success for the ‘Kentucky Kid’, as the American scored points in P15 despite never having ridden the bike, tyres or electronics. 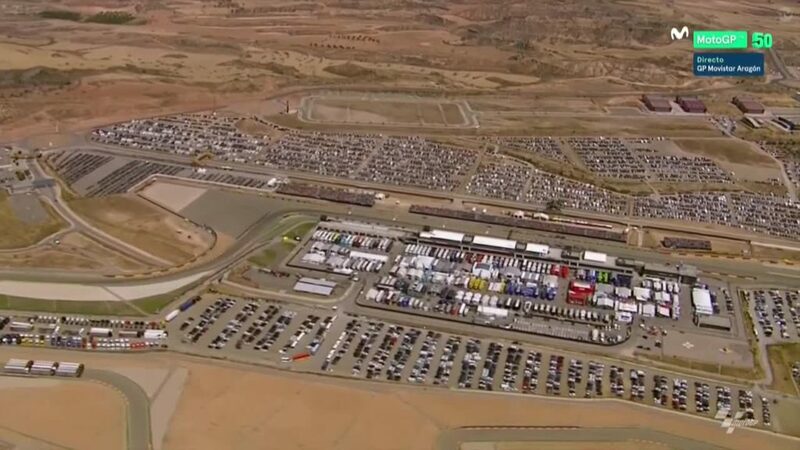 The land of the rising sun is the next stop for the 2016 MotoGP™ World Championship, as the Twin Ring Motegi beckons Marquez back to the scene of his 2014 title win – now 52 points clear at the top.